Falkville, AL – A serious problem existed in a large copper mining operation’s Tertiary Crusher Plant in Chile. The process to remove build-up in screens was carried out manually, using a lance with pressurized air. This job had to be completed twice a day— which meant 56 hours of downtime a month with a “high risk exposure to the personnel”. In addition, two hours a week would be wasted using a pneumatic hammer as part of weekly scheduled maintenance. Many loss-time injuries were registered due to using pressurized air lances. The workers also experienced shoulder injuries due to this strenuous activity. In May 2017, the Chilean operation installed Valley Rubber’s Inflatable Liner System. Inflatable Liners are profitable when installed in areas with extreme build-up due to high moisture contained in the material. These systems have customized rubber liners which inflate and vibrate with low air pressure (12 – 15 psi). This is provided by a plant airline controlled by a pressure regulator and an easy-to-use Valley Rubber control box. The control system allows users to set up the best configuration in order to keep the chutes clean with no build-up. These systems give long periods of availability without unnecessary maintenance in areas where they previously needed to stop to clean plugged chutes. • Control different feed pressure for each Inflatable Liner. • Control the inflation and deflation time. • Inflate liners up to 6”. • Inflate rubber liners sequentially. • Deflate quickly through relief valves. • Turn on / Turn off automatically, programmable. Inflatable Liners systems can provide 36 months of continuous operation. Computerized control boxes may be set up and customized in order to eliminate the build-up on the chute walls. It is important to note that air consumption is about 8.5 CFM and liners require just 8 psi. The Chilean operation had previously used 100 CFM and 80 psi (plant air) with pressurized air lances. The Inflatable Liners Systems decreased downtime and production gains of about 448,800 tons per year due to clean transfer chutes with no build-up, which gave continuous operation to the plant. 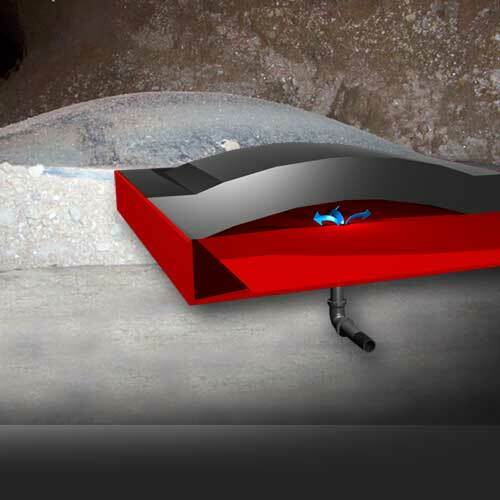 After 3 months of testing this Inflatable System, the customer was convinced of the effectiveness of the rubber liners because it allowed increased screening availability for the whole crusher line. In addition, the system has contributed to the reduction of man hours for cleaning and downtime. 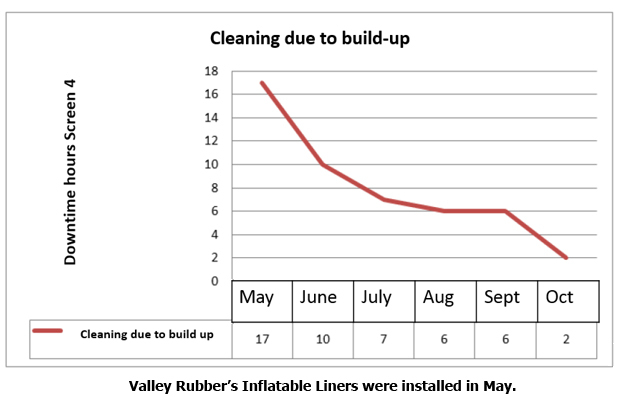 Overall, Valley Rubber’s Inflatable Liners increased the operation’s uptime by 7.5%.